Background/Purpose: Hospitalized infections during treatment with biologic disease modifying drugs (bDMARDs) in rheumatoid arthritis (RA) are a concern. This have mainly been studied in patients (pts) treated with tumor necrosis factor inhibitors (TNFi), and only to a limited degree in pts treated with non-TNFi (abatacept (ABA), rituximab (RTX), tocilizumab (TCZ)). The aims of this interim report, which is part of an ongoing collaborative project between Denmark (DK) and Sweden (S), were to explore a) baseline characteristics and b) 12-month risks of hospitalized infections in RA pts treated with ABA, RTX and TCZ in routine care. Methods: Observational, prospective cohort study conducted in parallel in DK and S. RA pts who started treatment with a non-TNFi between Jan 2010 and 2015 (DK: July 2015 and S: Dec 2015) were identified in the Danish DANBIO(1) and the Swedish ARTIS/SRQ registries(2). By use of unique identification codes, information on pts’ baseline clinical characteristics from the registers was enriched with information on previous malignancies, hospitalizations and hospitalized infections from the National Patient Registries (NPR). Information on hospitalized infections during follow-up was obtained from the NPRs. Follow-up was 12 months after treatment start or 90 days after withdrawal, whichever came first. Crude incidence rates (IR) of hospitalized infections were calculated for each drug in each country. For the current interim analysis, no formal comparisons of rates were conducted. Results: 8931 treatment series were identified. The numbers of ABA/RTX/ TCZ treatment series were 830/718/1098 in DK and 1872/2630/1783 in S, respectively (Table). Age, gender, functional status and disease activity were typical for RA pts, but a pattern of higher age, more frequent previous cancer, hospitalizations or hospitalized infections in RTX treated patients was observed in both countries (Table). The crude 12-month hospitalized infection rates were 5.84-8.76 in DK and 4.28-6.81 in S (Table). Conclusion: This collaborative project between DK and S included >8000 treatment series of RA pts treated with ABA, RTX and TCZ in routine care, and it demonstrated some channeling of patients to certain treatments, as reflected in differences in baseline characteristics. Variation in crude rates of hospitalized infections was observed across drugs and countries. Further analyses will explore underlying reasons that might explain differences in rates between the countries, as well as the impact of channeling, on the risk of hospitalized infections associated with each drug under study. Disclosure: K. Lederballe Grøn, None; E. V. Arkema, None; B. Glintborg, Abbvie, Biogen, 2; J. Askling, MSD, BMS, Pfizer, AbbVie, SOBI, UCB, Roche, Lilly, AstraZeneca, 2; M. Lund Hetland, Abbvie, BMS, Biogen, Celltrion, MSD, Novartis, Pfizer, Roche, UCB, 2. 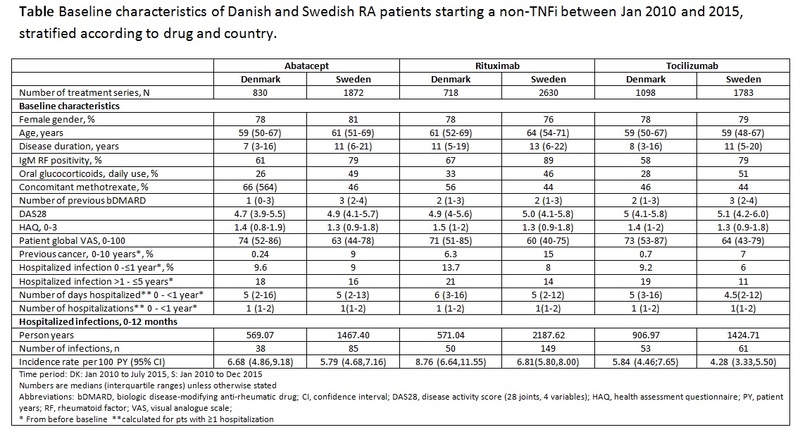 Lederballe Grøn K, Arkema EV, Glintborg B, Askling J, Lund Hetland M. Baseline Characteristics and Rates of Hospitalized Infections in Patients with Rheumatoid Arthritis Treated with Non-TNF Inhibitors in Denmark and Sweden [abstract]. Arthritis Rheumatol. 2017; 69 (suppl 10). 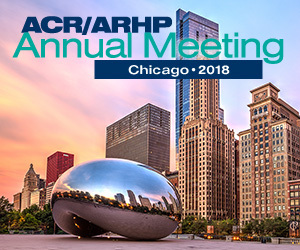 https://acrabstracts.org/abstract/baseline-characteristics-and-rates-of-hospitalized-infections-in-patients-with-rheumatoid-arthritis-treated-with-non-tnf-inhibitors-in-denmark-and-sweden/. Accessed April 21, 2019.